A Glen Ellyn tradition and our largest fundraiser of the year with more than 1,000 area patrons attending. All patrons receive a Tour Guide Booklet (TGB), which includes their ticket to attend. Inside are summaries of featured homes and advertisements from area businesses. Your sponsorship of the GEIW Housewalk - at levels detailed below - represents an excellent opportunity to win new business and the goodwill of our local community! All of the benefits of our Gold and Diamond Levels, and your business will be the sole business featured at one of our homes with prominent signage (see Gold level for full benefits), choice of ad placement inside Tour Guide Booklet (TGB), and six complimentary Housewalk tickets. Be the sole sponsor of a trolley taking Housewalk guests between homes and into downtown Glen Ellyn! The Diamond Level provides all of the great benefits of a Gold Sponsorship, and your business will be the exclusive sponsor on one of the 4 trolley shifts. Working with the Housewalk committee, we invite you to think creatively on how to maximize this opportunity, and please ride along and greet passengers if you'd like. NOTE: Offer limited to 4 sponsors. Please contact Pamela Gifford (202-459-8989) or Terri Gavronski (314-610-0426) or e-mail GEIWdevelopment@gmail.com if interested. Full-page advertisement in Tour Guide Booklet (TGB), year-long logo/link on the Glen Ellyn Infant Welfare website, a feature on the GEIW Facebook feed, business logo and cards displayed prominently at a featured home and your business name announced to guests at the start of each home tour, exterior logo signage at a home for two weeks prior to Housewalk, posters throughout town including business logo, business listing in TGB and logo on featured home page of one home in TGB, and four complimentary Housewalk tickets. Half-page advertisement in Tour Guide Booklet (TGB) and three complimentary Housewalk tickets. Quarter-page advertisement in Tour Guide Booklet (TGB) and two complimentary Housewalk tickets. Your business listed in Tour Guide Booklet and one Housewalk ticket. Your business listed in Tour Guide Booklet. GEIWdevelopment@gmail.com or Development Chair Pamela Gifford at (202) 459-8989, or Housewalk Chairwomen Terri Gavronski at (314)-610-0426). 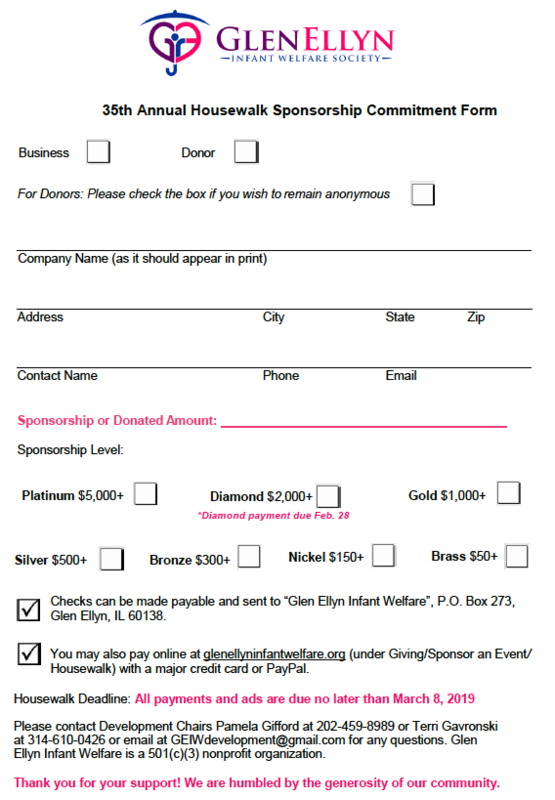 Payment can be made online at www.glenellyninfantwelfare.org, or checks can be made out to "Glen Ellyn Infant Welfare" P.O. Box 273, Glen Ellyn, IL 60138. We are a 501(c)(3) charitable organization. ​generosity of friends like you who make this goal possible.